Untouched mothers breed the untouchable. Oft touched mothers breed the venerable. Cricket is not a rational sport in India, and we go overboard. Cricket is a pressure game, and when it comes to an India-Pakistan match the pressure is doubled. Smoking kills so does eating beef. In India! The more corrupt the state, the more numerous the laws. Time not right for my return to India. Our culture in India is not a culture where we grudge each other. Everybody keeps saying that India’s a poor country. Yes, we have poverty. But I blame the government of India, the political establishment, for their failure to educate and therefore their failure to control the poverty. Whenever I do something, it is rooted in the Indian opportunity. It’s not quite right to be sitting outside India and to be judging what is happening in India. 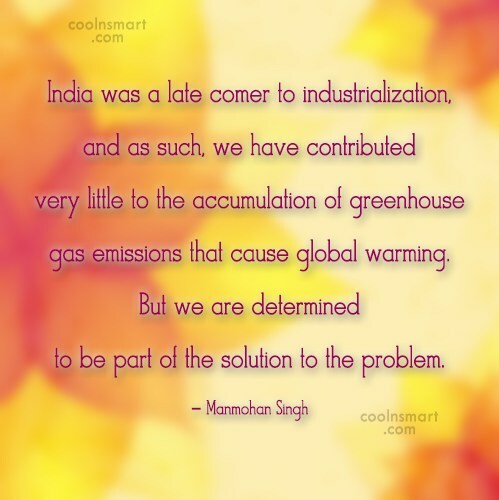 India was a late comer to industrialization, and as such, we have contributed very little to the accumulation of greenhouse gas emissions that cause global warming. But we are determined to be part of the solution to the problem. Jawaharlal Nehru wanted India to develop close ties with China and learn from its experience. India’s needs of energy are increasing at an explosive rate. If we work together, we can overcome these problems. There seems to be some success in our search for peace and harmony now. I can assure you we are a responsible nuclear power. Unity and secularism will be the motto of the government. We can’t afford divisive polity in India. India happens to be a rich country inhabited by very poor people. As for my stand, I think it has become difficult in our country to be a Hindu and a liberal at the same time.